I bought my Gucci Soho bag a while back, I was undecided between the Soho and the Disco but I eventually chose the Soho due to the chain strap and tassel, which I thought made it look more than a 'basic' bag. The round shape is also cuter and against the body, looks better. It's small but carries just the right amount of essentials. It's lightweight too so it never becomes heavy. So... what's in the bag? 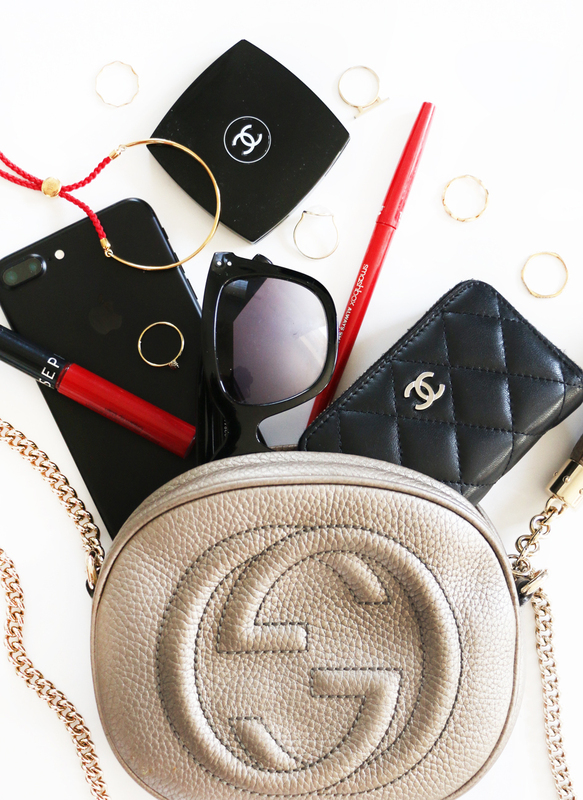 I usually carry my Chanel coin purse (with no coins, just cards), My iPhone which JUST fits (I have a 7plus), The lip colours I'm wearing that day which has mostly been Smashbox Ruby Liner and Sephora 01 lip cream, mirror, jewellery that I normally don't have time to put on and usually do so in the car and finally a pair of sunglasses - if it's sunny. Not a lot but enough to get me through the day. Plus I carry a extra diaper bag which I throw in my vlogging camera and anything else that doesn't fit.